1. It’s been clear for years that Michael Bloomberg would like to be president and even clearer that there is a network of political consultants who would like to get paid by Bloomberg’s hypothetical presidential campaign. 2. The simultaneous breakdown of the implicit hierarchical structures of both major parties, as evidenced by the nomination of Bernie Sanders and either Donald Trump or Ted Cruz would be about as good a chance as Bloomberg could possibly hope for. So it makes sense for Bloomberg to be looking seriously at a run if this happens. 3. As the Sanders campaign’s rapid response guy understands, Bloomberg talking about how he’d like to run against Sanders is very good for Sanders’ campaign against Hillary Clinton. 4. Many liberals looking at the Clinton-Sanders race are going to think that, especially given the GOP hold on the House of Representatives, the practical results of a Sanders administration would not differ greatly from those of a Clinton administration and vote for Clinton on electability grounds. The notion that Bloomberg and his social peers on Wall Street are living in terror of a Sanders administration undercuts this. 5. Efforts by the Democratic establishment to use the specter of Bloomberg as a cudgel to force people to vote for Clinton over Sanders seem likely to provoke resentment and backfire. People don’t like the sense that the fix is in. 6. There is, as wet blankets all across the pundit-land will tell you, no precedent for a third-party winning a presidential election (and if you understand the politics of the 1850s you will understand that Lincoln is not an exception). On the other hand, for both parties to simultaneously lose control over their own presidential nominating processes would also be unprecedented. So who knows? 7. State-by-state analysis of a three-way race likely misses the point. Bloomberg’s goal would be to achieve second place in national polling, and then try to sell himself as the Stop Trump (or Stop Sanders) candidate to loyal Democrats (or Republicans) operating on a fairly conventional electoral map. 8. Municipal government involves a lot of front-line service delivery, and the city councils of large cities are so overwhelmingly Democratic that in a practical sense legislative coalitions aren’t heavily shaped by partisan ties. 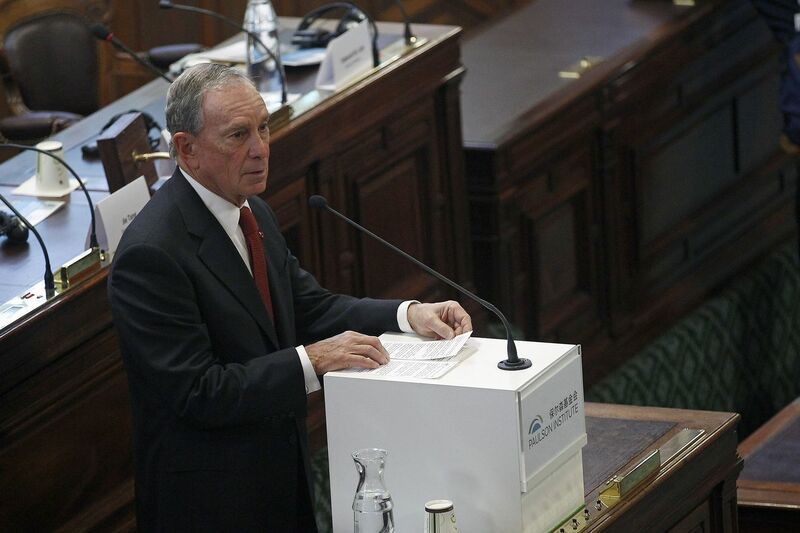 This allowed Bloomberg to be a three-term mayor who, like him or not, was reasonably effective in getting things done. The federal government is very different and it’s difficult to understand what non-party government would look like in the federal context. 9. It is, objectively, true that Bloomberg’s presence in a three-way race would make it much more difficult for Sanders to win by giving culturally and environmentally liberal voters with some doubts about the merits of socialism an option to not vote for the Democrat. 10. Committed leftists who truly believe in Sanders’ vision of a political revolution actually ought to welcome the idea of a Bloomberg run because it would foreclose the otherwise tempting option of Sanders trying to win the general election by pivoting to the center, explaining he’s not really a socialist, reassuring the mainstream Democratic Party donor class, etc. Sanders is less likely to win a three-way, but he if he does it will be with the same message he is using right now. 11. The United States has about 330 million residents and two political parties represented in Congress. Germany has 80 million people and five parties in parliament. The UK has 64 million people and 11 parties in parliament. In Denmark, 5.7 million people are represented by 13 parties in parliament. 12. In a simple model of a two-party system, both parties seek to offer broadly similar policies in order to appeal to a hypothetical median voter. 13. Hillary Clinton’s policies and Marco Rubio’s policies on everything from taxes to abortion to environmental regulation to gun rights are drastically different and yet large blocs of both Democrats and Republicans feel that these establishment contenders are excessively moderate. 14. Here’s a fun scenario: Ted Cruz wins the GOP nomination and Bernie Sanders wins the Democratic nomination. That tempts Bloomberg into the race as a self-financed independent and this, in turn, tempts Trump into the race as a second self-financed independent. Choices! 15. Speculation is fun, but realistically the odds are still pretty overwhelming that Clinton will be the Democratic nominee and we’ll have a yet another race in which hundreds of millions of people need to contort themselves into a binary choice between increasingly polarized parties.